The following day a larger group, including many children, gathered for practical workshops on liturgical singing. The event began with lunch and a social hour, allotting time for participants to get to know one another. Following a short introduction by Fr. Aleksa Pavichevich, His Grace Bishop Irinej opened the workshop sessions with inspiring words about the unique role that hymnography plays in the dissemination of Orthodox theology. He reminded the participants that the instrument divinely made, the human voice, is the instrument best suited for use in our liturgical worship. During the afternoon sessions, adults participants worked with Sbdn. Milan and Mira Damljanovic who taught basics of choir singing, including pacing, breathing, and technical work. Youth participants worked with Pdn. Jovan, playing musical games and learning three musical pieces. 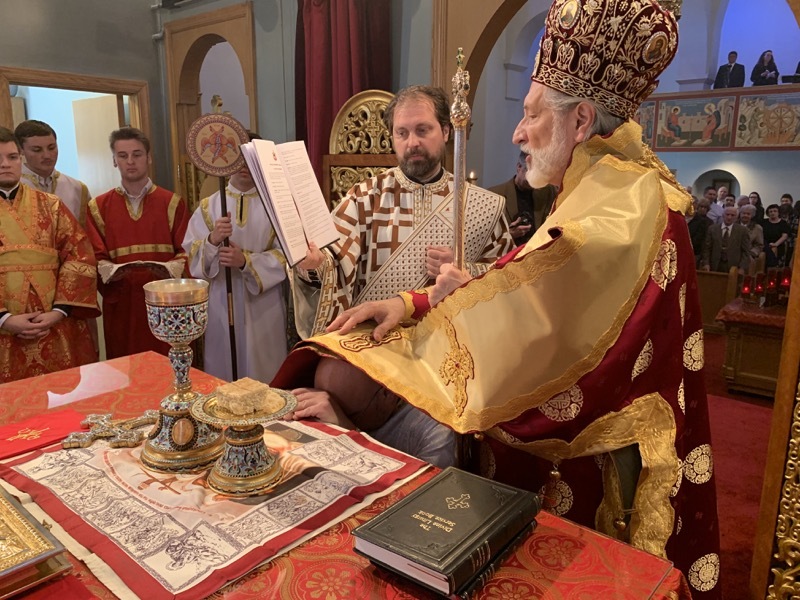 On Sunday morning, the workshop concluded as workshop participants joined the members of St. George Serbian Orthodox Church for Hierarchical Divine Liturgy. The community gathered early to greet their Hierarch, His Grace Bishop Irinej. Services began with the baptism of Pierce Michael Scott, child of Sarah and Kyle Scott. 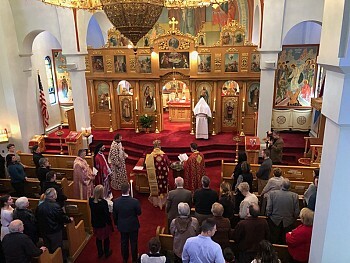 Family and friends rejoiced as His Grace Bishop Irinej not only celebrated the baptism, but took time to explain the significance of each part of the service. His words provided an extra dimension of depth and meaning for all those gathered. I seek ordination into the Holy Diaconate, Your Grace. My life has been a journey of preparation for the service of the Holy Church and to God. I was born, Baptized and raised in this house of God. From my years as a youth I was blessed being an Alter Server under the grace of our beloved Father Slobadan, of blessed memory, it was his caring and love that brought the Orthodox faith into my heart, a kind and loving man of God. Father Slobadan became my spiritual Father, his love set me on this path. This Holy House was built by the caring and loving families of this parish. To be a witness of that devotion and love is humbling. This church is more than bricks and mortar, it is a church full of the love of God, love of family and love of the Orthodox community. A beauty of faith that holds all of us together, to worship and give thanks to God. To my Baba and Jedo who had the courage to come to this country, but also to hold our heritage near and dear. Their Orthodox faith passed onto their children and their grandchildren has been placed in my heart by their devotion and love. To my parents who raised me in a loving home, where God and family was the center. Both my parents have fallen asleep unto the Lord, my father suffered a long illness rendering him to be bed confined, his spirit was remarkable, always pleasant, always faithful, always full of love, I miss him dearly. To my mother who taught me how to be a faithful and loving person. My mother stood by my father, caring for him, loving him, committing her life to his care, and just before her death from cancer, asking if I was alright and if I would take of Dad. My mother was my rock, I can see her sitting in church with a beautiful smile, I love you and miss you Mom. My children are a perfect gift from God, their beauty and love consumes me, my daughter Kristina is the light in my eyes, she is my voice when I could not speak, my advocate. Her spirit is a gift from God and that gift she freely shares. My son Kyle, he has become my role model, the pupil became the teacher, his strong presence and his strong faith are unmatched, when the doctors gave up on my survival, Kyle stood tall and refused to believe I would not survive. His faith in God was strong. To Bryan my son-in-law, a devoted person, taking care of my most precious gift from God and bringing into our lives another gift from God our Grandson Noah, a pure love of God. And to Dan and Jo Riegler, my in-laws, their love and support are unmatched, always there, always helping but most important always loving. To my beautiful wife Denice, my support, my love, my partner for all eternity. It is my wife without exception that reads the bible daily, praying and giving thanks to God. It was her prayers that God answered when I was in the strong grasp of death. Her beauty lies in her faith, her family and her heart. I could not be without her, today we stand here together. God has blessed us! It was in illness and near death that God sent two Angels and filled my heart with a calling to be a servant of God. It was God the perfect physician that healed me from cancer, gave me peace, answering the prayers of family, community and friends. Serving our church in many capacities has given me much insight, serving as member of the church board, being active within the parish, cooking, cleaning and tending to the needs of the church has brought a mission of service. Serving our church as a subdeacon has offered many lessons in my faith, in my love of God and service to our church community. The blessings of the opportunity to study Orthodox theology with the St. Stephens program has given light to our faith, an understanding of Orthodoxy and a liturgical life. Seeking knowledge and understanding will be a life long commitment, as will serving God. To assist with Father Aleksa with education and starting missions for our members is a blessing, to share what we learn and to grow the orthodox faith. My greatest preparation has been that of prayer, giving thanks to God for a life that has been filled with his blessings. A life Full of God’s love, a life of family, church and community. In my private prayers, is where I find peace, guidance and love. God has filled my heart and sent me on a path of service, to honor him and praise him for all gifts. Your Grace, I seek the Ordination into the Diaconate, to be an obedient and faithful Orthodox servant. To serve this Holy House, our orthodox community, to serve the Diaconate and the Priesthood and our Bishop. To be a servant of God. Following Divine Liturgy, the faithful gathered for a meal at the St. George Event Center. Near the end of the meal, two newly formed groups of folklore dancers at St. George Serbian Orthodox Church, youth and teen, performed their first official dances for their beloved Hierarch. Four children who have begun to learn vocal and instrumental Serbian music, performed "Tamo Daleko" for everyone as well. It was a moving performance, and a gift from the youth of the parish not only to His Grace Irinej, but to all those that joined the community in prayer that day. Thanks be to God for the spiritually uplifting, and enriching, weekend!